What Medium Will the Digital Revolution Destroy Next? For print, the beatings will continue. Henry Blodget's presentation of The Future of Digital is a mammoth slideshow with some delicious nuggets. The three-word takeaway is "Money follows eyeballs." If you want to know where the money is going, follow our attention. That makes this graph, adapted from the widely shared (and occasionally maligned) Mary Meeker presentation, perhaps the most important of the slide. 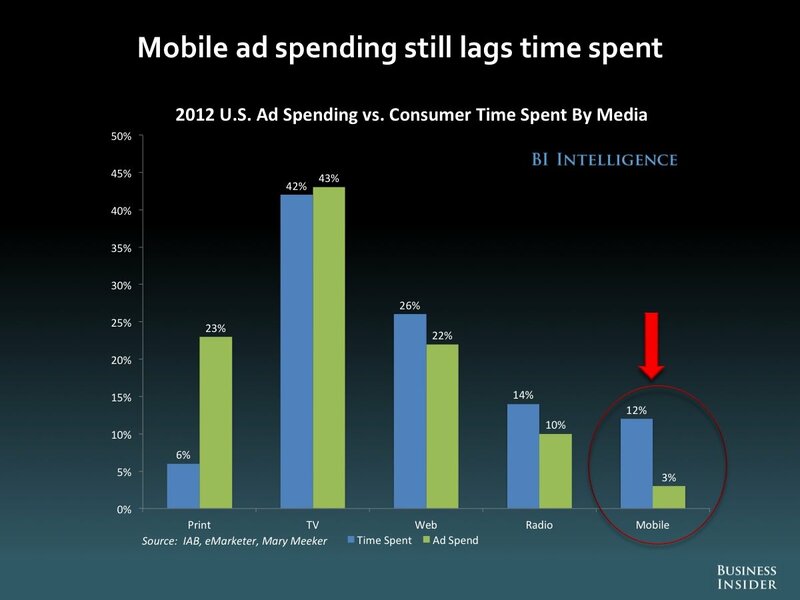 It shows consumer attention vs. U.S. ad spending. Here is is, rendered a bit more visibly, in Meeker's presentation. Blodget is bearish on pay-TV and I am not bearish on pay-TV, and this graph is why I humbly think I'm right, at least in the short term. If TV accounts for 42 percent of our attention and 43 of ad spend, that does not strike me as a concerning gap, particularly when you consider that TV attention is categorically different from, say, smartphone and desktop attention. People check their smartphones for two seconds and open and close tabs within minutes. But a television show is half an hour to an hour long, and Americans still average up to four hours a day watching this stuff. That's the sort of sustained attention that makes TV ads valuable. In fact, it was this sort of sustained attention that made newspaper and magazine ads valuable too, before the Web took those articles, ripped them clean from their bundles, and threw them into the wind, where they and their adjacent ads scattered into the infinity of Internet. 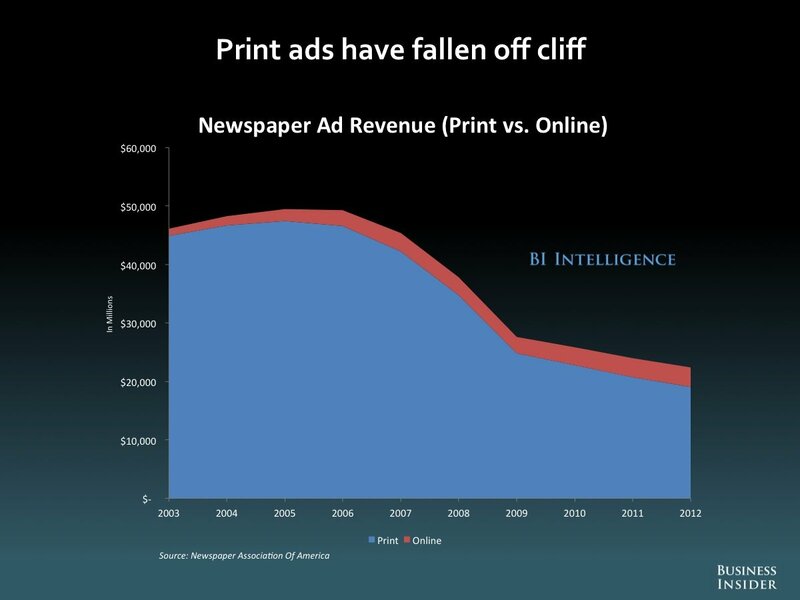 As a result, print ads have tumbled violently. There are new bundlers now -- or aggregators -- and they are digital companies like Google and Facebook that create a destination for people to search and discover that infinity of content that used to be bundled. 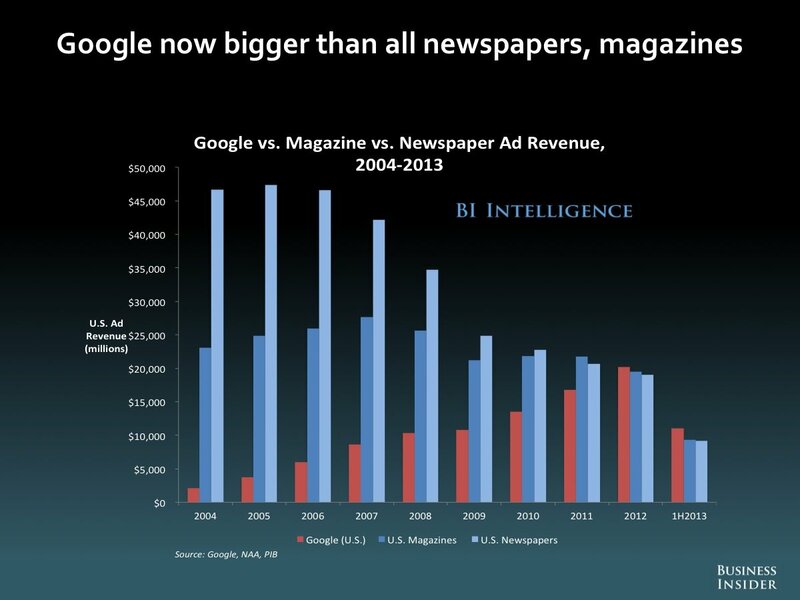 This is why Google now makes more money from advertising than magazines or newspapers. If you, like Blodget, think that money follows eyeballs, you should expect the near future to look like the near past. The big disruption won't necessarily be with TV. It will be ... more print disruption. If print advertising continues to fall in line with its share of attention, it suggests print will lose tens of billions of dollars more of advertising in the next few years.